Google has once again updated the orkut interface. You may need to spend some time to build your groups, if you want to socialize differently with Friends, Family and Co-workers. Start the Guided tour ! While Facebook and Twitter have lots and lots of apps for mobile and desktop, Google’s Orkut didn’t have any. Last week Google has announced java API for orkut. We can soon expect few orkut apps for mobile (an iPhone app?). I had previously posted that why dont Orkut photo albums integrate with Picasa? Now I see Picasa photo albums can be directly imported to Orkut, and I don’t need to upload my photos again in Orkut. I am expecting Picasa to integrate Piknik (a popular online image editing website), since it was recently acquired by Google. Read the official Orkut post. Google has removed “Friends Suggestion” feature from the Orkut home page. That feature is replaced with a new feature to “Email friends to join orkut” which shows random 5 contacts from GMail contacts, who either do not have an orkut account or use a non gmail email account. This clearly shows that instead of making users to add friends who are already using Orkut, Google tries to make the users invite their friends to orkut, who are new to orkut. 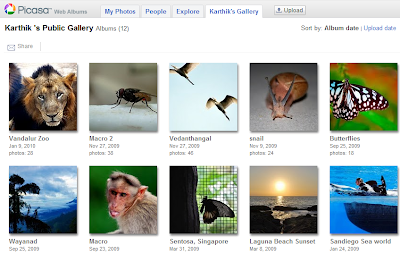 why dont Orkut photo albums integrate with Picasa? In how many websites do you upload the photos, and have redundant data in the web? I hate uploading the same photos which I already added to my Picasa album, again to Facebook / Orkut, just for sharing with my friends. Facebook has a very good solution for this. Fotofan app can directly bring my Picasa albums to my Facebook profile, with a separate tab called Picasa tab. In addition to this, updates will be posted to my wall automatically whenever I add photos to Picasa. Orkut and Picasa being Google’s own products, Orkut doesn’t have a similar feature. Orkut apps are not even comparable to Facebook apps. Long way to go for Orkut applications. But Google has merged photos uploaded to Blogger blogs, to Picasa albums. The blogger buzz post asks “Ever wanted to see all the photos you’ve uploaded to your blog in one place?” and the Blogger photos are integrated in Picasa, I am wondering why Orkut albums cant fit with Picasa? 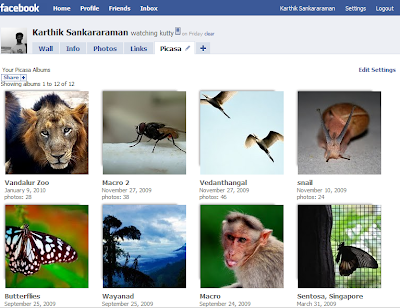 If Orkut albums integrate with Picasa, even the photo comments can be synced between Orkut and Picasa albums. Let us wait if it can ever happen. Update: There is a new link for feedback in Orkut: Have an opinion? Tell us! In the new orkut.com page, today there is a broken link for feedback. Orkut promote is for every orkut user, who wishes to promote / publish / spread any News / Video / Photo / Message. It can be just spreading a comment about a movie that you watched, or sharing your Picasa/Flickr album to your Orkut friends, and friends of your friends (If your friends click the promote button, when they see your promotion), and so on. Orkut promote is available only for limited number of users. Check whether the Orkut promote link works for you. Orkut share API is useful for any website owner / Blogger, to promote their content, by requesting the visitors to share the content via Orkut. Orkut share and Orkut promote may look like two different features of Orkut, but both of the APIs share and spread the links / videos / photos in the same way. Found something interesting ? Share on orkut !